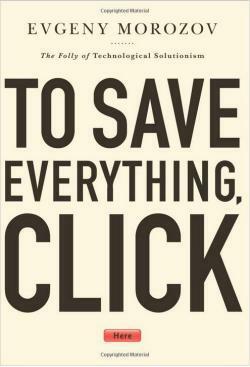 To Save Everything, Click Here: Farhad Manjoo and Evgeny Morozov debate Morozov’s new book. A few weeks ago, while traveling from my home in Palo Alto to the South by Southwest Interactive Festival—that is, between two of your favorite places in the world—I loaded up the Kindle app on my phone and began reading your new book, To Save Everything, Click Here: The Folly of Technological Solutionism. Since then I’ve cycled through a variety of devices and apps to read and jot down my reactions to your polemic against the tech industry and its windy boosters, and I’m thrilled to be chatting with you about it this week. Not surprisingly, Jarvis is one of your main targets in To Save Everything, and what I like best about your book is that you’re still not pulling any punches. (Disclosure: You critically cite my own work in a couple of places, though, mercifully, I’m one of the few people you handle with kid gloves.) I enjoyed the many barbs you hurled at Jarvis and your other intellectual opponents, including the speculation that their ignorance stems from being “too young or inexperienced with books” and the claim that they possess a “knowledge of history … reduced to tweet-length CliffsNotes.” You’re one of those writers who likes to show off his superiority by quoting your opponents’ grammatical errors with an appended [sic]. In other words, you’re a fighter, Morozov—and it’s not without a bit of trepidation that I jump into the ring with you. But let’s get to it. To be honest, your take-no-prisoners tone is pretty much the only thing I liked about your book. Your central thesis in To Save Everything is that “Silicon Valley” is pushing society on a “mindless pursuit of … silicon Eden” that will ultimately cost us nothing less than “human freedom” itself. You go after lots of movements abetted by technology, including efforts to improve government and politics through “open government” and “post-partisan” schemes (for instance, the Obama administration’s Data.gov site and its online petition system, or the much-ridiculed group Americans Elect); “predictive policing” systems that use digital technology in an attempt to prevent crime; the “quantified self” movement, whose members track their health data using gadgets like the Fitbit; and “gamification,” the idea that we can subtly change people’s behavior (e.g., get them to eat better and exercise more) by using the kinds of incentives one finds in video games (points, achievement badges). OK, so that explains why you won’t Snapchat with me! Seriously, these are grand claims for which I expected some evidence of actual harms. But while you spend much time exploring technology through the lenses of history, philosophy, and sociology—I don’t think Bruno Latour has ever enjoyed so much appreciative ink—your research into what’s actually happening in the tech industry today, and how real people are using the gadgets that you deride, feels thin. Indeed, for someone who’s so aggressively skeptical of the industry, you’re strangely inclined to accept its marketers’ most overhyped claims about the potential of their wares. Without citing much evidence, you take tech boosters at their word that, among other things, predictive policing will “eliminate” crime, dubious “truth-detection” software will “eliminate” lying in politics, gamification really does change people’s behavior, and self-tracking technology will become cheap, useful, and socially acceptable enough to turn self-quantifying into a widespread social phenomenon. Rarely do you pause to question whether these technologies will fail for reasons that are far more conventional than their capacity to ring in dystopia—that, as happens all the time in tech, they won’t work, they won’t sell, or we’ll all mock them so much on Twitter that they’ll die of shame. Given how speculative it is, the lather you work yourself into over the smart kitchen’s potential for problems feels, at the very least, premature—and probably completely unwarranted. Could Lei’s kitchen someday go on sale, thereby pushing us down the road to enslaving our chefs? Yes, I suppose. But even if that happens, why do you assume that cooks won’t reject it? After all, don’t chefs already reject certain technologies for the very same reasons you cite—because it imposes burdens on their creativity? Thomas Keller isn’t cooking with Campbell’s cream of mushroom soup, even though it would save him a bunch of time. So why should we worry that he’ll adopt hectoring surveillance cameras? This is not a one-off example. Again and again in To Save Everything, I found you fretting about big problems that stem from picayune techie ideas that will likely never go big. Some of them are so obviously silly that they died while you were writing the book—see how Americans Elect failed on the launch pad or how Foursquare, the tech company most closely associated with gamification, is now moving away from that approach. Others, like the quantified-self movement, seem to exist only among that population of weirdos one finds in New York Times trend stories. Have you ever met a true quantified selfer—a person who genuinely believes, as you write, that by measuring his steps and sleep patterns he’ll reveal “some deeper inner truth” about himself, his desires, and his future? I live in Palo Alto, the supposed epicenter of techno-narcissism, and I don’t know a single person who thinks that way. Most people who use devices like the Fitbit (including myself) do so for completely pedestrian reasons (to track one’s health, in the same way you’d use a bathroom scale). I’ve read the trend stories, so I don’t doubt that there are a few people who take self-tracking very seriously. But why should we regard them, as you do, as a powerful new tech constituency that will force us all to adopt their passions? This gets to my biggest problem with To Save Everything. The “Silicon Valley” of your book bears little resemblance to the Silicon Valley that I cover as a tech reporter. Your Silicon Valley is a place where everyone is on the same page—where we all evangelically self-track and gamify, where we take it for granted that “open” systems are better than “closed” ones, where we put our faith in algorithms over humans, and where we’re obsessed by jargony pundits like Jeff Jarvis. But that gets the Valley wrong. In reality, the tech industry is much messier, more contentious, and savvier about hype than you make it out to be. Note that Apple—the most profitable company in the Valley and the brand that outsiders most associate with the place—defies all the archetypes you say typify Silicon Valley’s worldview. Apple just wants to sell you stuff; it has no interest in making you more efficient, in fighting crime, improving politics, or solving any of your other problems. So isn’t Apple a problem for your thesis—if the Valley’s top company doesn’t fit the solutionist model, shouldn’t we be skeptical that it’s a real phenomenon? Finally, let’s note something about Jeff Jarvis. Though you often associate his views with those of “Silicon Valley,” Jarvis is neither an engineer nor a Californian—he’s a media consultant who lives in New York. Yes, he’s a best-selling guru, but you understand that nobody in the tech industry takes him seriously, right? (See the hilarious Twitter parody.) Criticizing the tech business by focusing on Jeff Jarvis seems disingenuous to me—it’s akin to citing Deepak Chopra as an example of all that’s wrong with modern medicine. Can’t we just agree that Jarvis is a very silly man and then forget about him? 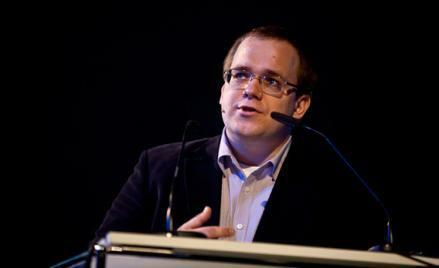 Evgeny Morozov will be discussing To Save Everything, Click Here on Monday, April 15, at a Future Tense event in Washington, D.C. For more information and to RSVP, visit the New America Foundation’s website.